‘Meet the experts’ is the word from 18th to 21st April at the ENGEL trade fair booth at Chinaplas 2012 in the Shanghai New International Expo Centre. Five leading edge topics will be presented in Expert Corners. On top of this, three production cells demonstrate how application and industry-specific state-of-the-art technologies can improve productivity, efficiency and sustainability in injection moulding operations. 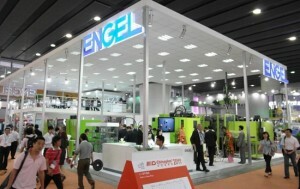 Chinaplas 2012 sees ENGEL present a new exhibition concept in Hall E2, Booth D 01. Five leading edge topics will be presented with videos and sample parts. “Additionally, we have experts from ENGEL China and from the business units at ENGEL’s headquarters in Austria on site to talk to trade fair visitors about today’s and future challenges”, says Gero Willmeroth, ENGEL’s President Sales and Service in Shanghai. The focus will be on the trend topics lightweight construction, automation, LSR processing, process monitoring and glazing. ENGEL implemented the Expert Corner Glazing in cooperation with Bayer MaterialScience. Three production cells at the ENGEL trade fair booth add a hands-on touch. They cover a wide range of the today’s major growth drivers in China, from automobile manufacturing, through the teletronics industry, to medical technology. ENGEL will be producing automotive components on an ENGEL duo 5550/700 pico injection moulding machine from the machine manufacturer’s production facility in Shanghai during the four days of the fair. The production cell is automated with an ENGEL viper 40 linear robot. ENGEL recently extended its viper robot range. Now, six sizes with nominal load bearing capacities of between 6 and 90 kg are available. Following the trend for sustainable, energy-saving production solutions, the duo large-scale machine is equipped with the ENGEL ecodrive energy saving servohydraulics, and ENGEL flomo cooling water distribution system. The ENGEL flomo – flow monitoring system – is one of the smallest manually adjustable cooling water distribution systems with electronic monitoring on the market, and a particularly economic alternative to the popular, maintenance-intensive cooling water arrays with sight glasses. This is ENGEL flomo’s first appearance at a trade fair in Asia. For the teletronics industry, ENGEL will be exhibiting a tie-bar-less ENGEL victory 330/120 machine with a viper 12 robot that will be producing covers for mobile phones on a mould by Nolato, Beijing/China. “The ENGEL victory machines give plastics processors excellent support when it comes to saving investment costs and energy”, Willmeroth emphasises. “Because there are no tie-bars in the way, you can use the mould mounting platens right up to the limit. In many cases, you can deploy a far smaller machine than a mould of this size would traditionally need. A smaller machine uses less energy and is cheaper to buy.” This benefit is mainly felt in multiple-component applications which typically need large moulds, but only comparatively low clamping forces due to the fairly small projected parts surfaces. ENGEL will be demonstrating how precisely fully-electric injection moulding machines work with a medical technology application. An ENGEL e-max 310/100 will be producing protective caps for hypodermic syringes. The 48x mould for this application was supplied by ENGEL system partner Kebo, from Neuhausen/Switzerland. To be better prepared to meet increasing demand in Asia, ENGEL has doubled the capacity of its large-scale machine production facility in Shanghai. In future, more than 200 ENGEL duo machines per year will leave the works. The building work at the ENGEL Shanghai site at Xinzhuang Industrial Park will be complete by Chinaplas. On the third day of the fair, ENGEL will inaugurate the substantially extended production shop together with customers and partners. “We have steadily expanded our market share in China and we intend to continue this trend.”, says Willmeroth. In line with this, the number of staff at ENGEL in China grew substantially last year. In Asia, ENGEL consistently promotes a piggyback strategy. Modular injection moulding machines, which fulfill essential regional requirements, are produced locally, while custom designs with sectoral engineering needs come from Austria. “Decentralised production guarantees short delivery times to our customers in Asia, and thus a short time-to-market and the ability to adapt our machines, automation and technologies to the individual, local requirements”, says Gero Willmeroth. In Asia, ENGEL is producing at two facilities; large-scale machines in Shanghai, small to mid-sized machines in South Korea.